"Heather was very agitated and very emotional at times today. She's a little frustrated but has been very alert all day. She spoke today for the 1st time. When asked if she had pain she said "yes" and when asked where she said "my jaw, my neck." It was a long day but it was a step in the right direction. "Heather had a nice visit from Chuck Grassley during his tour of On With Life today. She was in physical therapy when he stopped by her room so he poked his head in down at the PT room." "Heather continues to talk, although it is hit and miss whether it makes sense or not. She's very emotional, frustrated and agitated at times. She's moving her left side and her right leg. She can't stand due to the pelvis fracture. Her jaw is still wired shut, and while the trach tube is capped, it's still in. She's confined to a tented bed at night to keep her from trying to get out of bed." Update on Heather from Troy Thursday: Heather continues to talk, although it is hit and miss whether it make sense or not. She's very emotional, frustrated and agitated at times. She's moving her left side and her right leg. She can't stand due to the pelvis fracture. Her jaw is still wired shut, and while the trach tube is capped it's still in. She's confined to a tented bed at night to keep her from trying to get out of bed. 6/14 - Chase went to see his mom yesterday for the first time. Then he went back again today. Tonight at 9 p.m. he wanted to see her again so we loaded him up and trucked across town to see her again. She could barely keep her eyes open but it was a good visit. 6/15 - Took Chase and his bicycle to OWL today so Heather could watch him ride his bicycle. He was very proud and she was very happy to see him. 6/17 - Heathers first outing today to the ENT who fixed her facial fractures. Heather got her jaw unwired today. The arch bars and trach tube are still in place but they are scheduling a time to take those out/off in the next week or so. Everything seems to be healing. 6/19 - Heather ate ground up lasagna today, her first real food. She did okay. She's just about eaten OWL out of their entire stock of Frosty Thick, which is best I can tell some sort of pseudo sherbert substitute. Please keep the DeJoode family in your thoughts and prayers...Heather is definitely fighting and with Gods help, she is improving more and more each week! Heather is back in the hospital tonight for at least one night with a blood clot in her leg. Thanks to Jamie, Heathers nurse at OWL who figured it out and pressed to have her sent to the ER on a holiday when nothing else was open. "Heather is back at On With Life. She did have extesnive clotting in her left leg but seems to be slowly getting better. It's good to have her back where they understand some of the challenges her type of injury causes." "thanks t the blue moon crew for turning what began as a rough day into one of Heather's best days since the accident it was great to see everyone. 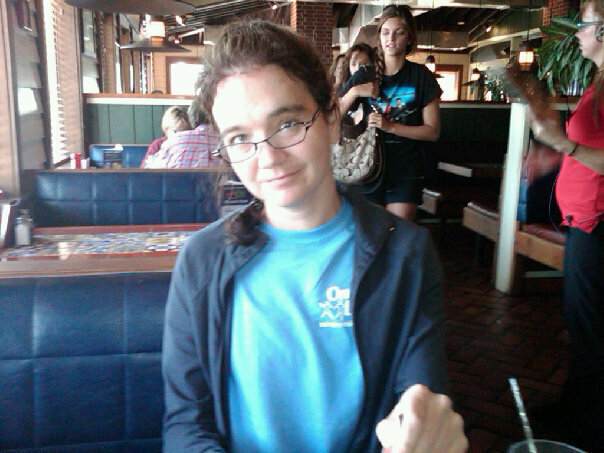 Heather had a great time, one of the most 'normal' days she's had." 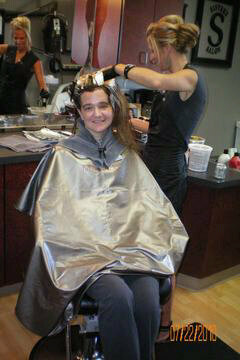 See attached photo of Heather getting her hair done. Heather is progressing nicely in her healing. Continued prayers for strength and healing for Heather and her family and friends. Update on Heather posted yesterday from Troy...she's doing so well! Heather came home tonight for the first time. She didn't go inside, just sat in her wheelchair in the driveway watching Chase, and then went for a walk (or roll as the case may be) with Chase on his Gator to the end of the block. Apparently it was hide from the DeJoode's night in the neighborhood since the normally bustling street was quiet. Update on Heather from Troy...please see attached photo: "Heather doesn't find my random photography amusing." From Troy: last night was Heather's last night at On With Life. She will come home today. She has a long recovery ahead. Heather arrived at OWL on May 27 in a coma. Today, 119 days later she could walk out w/o the aid of an assistive device. No wheelchair, no walker, no cane. Just herself. It's not a miracle, just the... simple combination of my very stubborn wife & the OWL team who are simply the best at what they do. I have to disagree - it IS a miracle and it IS because of God putting the right people with Heather during her time of need. We have an awesome God! Many, many prayers were said for Heather and her family and I know that they were answered. A small write-up by the Gazette on Heather's coming home....Welcome Home Heather! ANKENY, Iowa -- An Ankeny family involved in a deadly crash that killed two of their children released a new statement on Friday. It's been almost six months since the crash happened to the DeJoode family. Police said 46-year-old Kevin Dalasta drove past a stop sign at an Ankeny intersection and crashed into the DeJoode van in May. No charges have been filed in the case. "In response to media requests, we would like to provide an update to the community about our family. "Five months after the devastating accident that took the lives of our two children, Carson and Claire, and left her with life-altering injuries, my wife, Heather, was finally able to come home last week. "Heather is resting and recuperating at home after being released from On With Life in Ankeny. When Heather entered On With Life, she was admitted to their coma/minimally responsive unit. She would occasionally open her eyes but showed few other signs of consciousness. She spent four months in their post acute, inpatient rehabilitation program. While at On With Life, she received daily, intensive therapies. "Upon discharge, Heather walked out of the building without the use of an assistive device. She will, however, continue to need extensive ongoing physical,/ occupational and cognitive outpatient therapy. "We are infinitely grateful to the staff at On With Life for their incredible support of our family through this difficult time. Heather will have extensive continuing therapy, but we are grateful for the progress she has made and attribute that progress to two things: Heather’s determination and the amazing care she received at On With Life. "Heather is aware of the accident and the devastating loss of Carson and Claire. She, like the rest of us, is coping as best as she can, given the circumstances and her injuries. "Chase, our three-year-old son, is home doing as well as he can. He is keenly aware of the accident and the resulting deaths and injuries, as he was conscious throughout the accident, as well during his time in the hospital. "I returned to work in mid-June and am very appreciative of the incredible support from my employer, Jacobson Companies, and my co-workers. I am also greatly appreciative of our neighbors, friends and the entire community who have reached out in every way imaginable over the past five months to make life manageable for us." "Our children, Claire and Carson, were organ donors. It was a difficult choice but one with which we are tremendously pleased. We have never regretted this choice and that was reaffirmed when we learned of the good that came of their donations. Carson’s liver went to a 5-month-old boy. Carson’s left kidney went to a 52-year-old mother of two who’s been undergoing dialysis three times per week since November 2007. Carson’s right kidney went to a 50-year-old mother of six who’s been undergoing daily dialysis for two and a half years. Carson’s heart valves went to help two children. Carson’s corneas went to an 8-year-old girl and a 40-year-old man. Claire’s heart went to a 3-month-old boy who was in end stage heart failure. Claire’s liver went to an 11-month-old boy. Claire’s kidneys went to a 51-year-old mother of seven. "Organ donation allows common people to do uncommon good. The choice to donate life is extremely personal. If nothing else good comes of our situation, we hope that everyone will educate themselves about the need and importance of organ donation by going to www.iowadonornetwork.org. "While our primary focus has been Heather and Chase’s physical, emotional and cognitive recoveries over the past five months, it is difficult not to concern ourselves with the potential criminal proceedings. We are anxious for justice to run its course so that we can close this chapter and go on about our lives. We have a tremendous confidence in the Ankeny Police Department and all the law enforcement agencies who have been involved in the investigation, as well as the Polk County Prosecutors office that justice will be served in due time."